Christmas day. Coldest day so far; thermometer 8°. Had our usual family gathering, — twenty at the large table and ten at the small one at dinner. Charlotte Sorchan and Isabella Harriman, with their husbands, came on from New York. In the evening had dancing and a kinetoscope entertainment. Comments: Horatio Hollis Hunnewell (1810-1902) was an American banker, horticulturalist and philanthropist. His diary entry is a very early record of a home cinema entertainment. 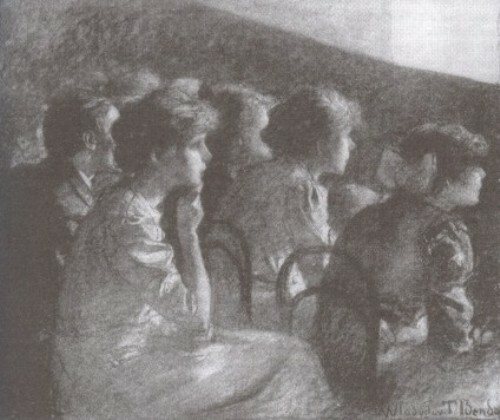 The use of the word ‘kinetoscope’ probably indicates motion pictures in general, rather than the Kinetoscope peepshow itself, and the entertainment is likely to have been projected on a screen. At the time he was resident at Wellesley, Norfolk County, Massachusetts. This entry was posted in 1890s, Diaries, USA and tagged Domestic, Horatio Hollis Hunnewell, Wellesley. Bookmark the permalink.